I get most excited and energized by blogging, running and rock music so I am always thrilled when I get the opportunity for a passion trifecta to blog about running and music. Welcome to workout Wednesday when each week I share a new running or strength for runners workout. This week we have a fun running workout that takes all the pressure and stress out of your runs and lets you just go with the flow, or the beat of the music. The idea is to create a playlist with the beats per minute or BPM in mind. We start with a song with a mid tempo BPM for a moderate pace to warm up and then alternate between higher BPM songs and medium BPM songs until the run is complete. We naturally match our stride to the BPM so we may feel motivated to keep up a faster pace in sync with the music. Since most songs are around three minutes long (give or take), a playlist built around BPM can be the perfect high intensity interval workout. The Playlist HIIT running workout. Save to Pinterest for later. Start off with a song with a mid tempo BPM to get started, then make the next song on your playlist an uptempo song with 155-185 BPM. Some say 180 is the perfect BPM for runners as it's been claimed that 180 strides per minute is the most efficient turnover. How do you find BPM of popular songs? The site songbpm.com lets you enter any song and it returns the BPM. Spotify also has playlists built around BPM, so you can pick and choose your favorite songs to build you own playlist HIIT workout around the music that you love. If you like alternative rock like I do, your playlist might look something like mine. With this playlist we are alternating between mid tempo and up tempo songs. I created a playlist on Spotify if you want to hear my song selections. Create your own playlist with the music that you love. Create your own playlist and see how it feels to run by music bpm. As a running coach I will advise you to not try to run faster than your current fitness level. If you can't keep up with the tempo of the song, it's always better to go at your own pace for safety and sanity. I'd like to thank hubby, the drummer, for a little bit of music education as I put together this post. Like this post? Know someone who might like it too? It helps me when you share with your friends and followers. Happy Friday, friends! We made it through another week and it's time to relax and recover for the weekend, unless you're anything like me and you have family to attend to, friends to see, chores to get done and a race that's not going to train for itself! Weekends may offer a change from the routine but they often can be busier than the work week! While weekends may be our chance to unwind a bit, don't let the freedom of the weekend derail all your health and fitness goals. While it is perfectly acceptable (and encouraged) to indulge once in a while to stay sane and happy, I try to keep my diet and exercise plan on track throughout the weekend, despite the craziness. One way to start your weekend off on the right foot is with a high protein breakfast. Consuming protein helps us stay feeling full and satisfied longer after we finish our meals. It is also necessary in order to breakdown, build and preserve lean muscle mass. If you are trying to lose weight adequate protein intake is essential. 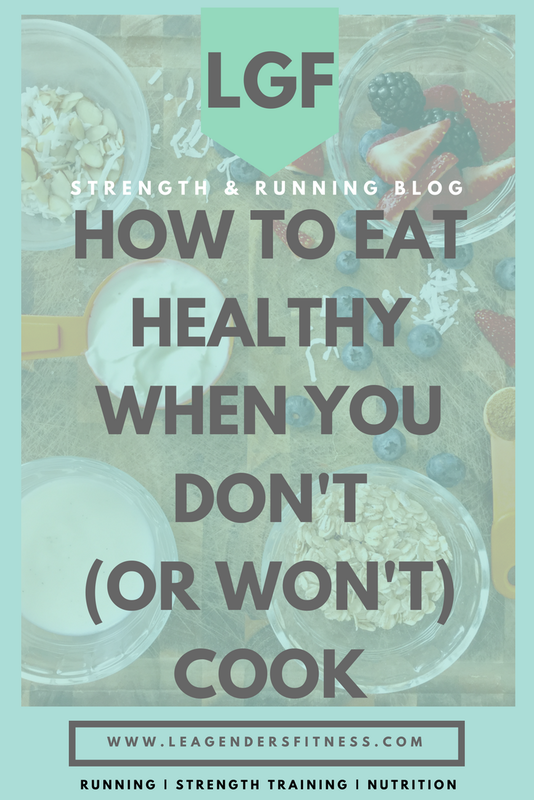 When you lose weight, you want to make sure you are losing fat and not muscle. Preserve muscle while you lose weight by Including resistance training in your workouts and consuming enough protein. Depending on your goals, aim for .5 to .8 grams of protein per pound of body weight. 150 lb person may aim for 75 grams (to preserve lean muscle) to 120 grams (to build muscle) per day. If you are getting considerably less than this now, start on the low end. Protein shakes don't have to be boring. I wrote a post over on my other blog and since I know all my readers don't subscribe to both blogs (but please do!) 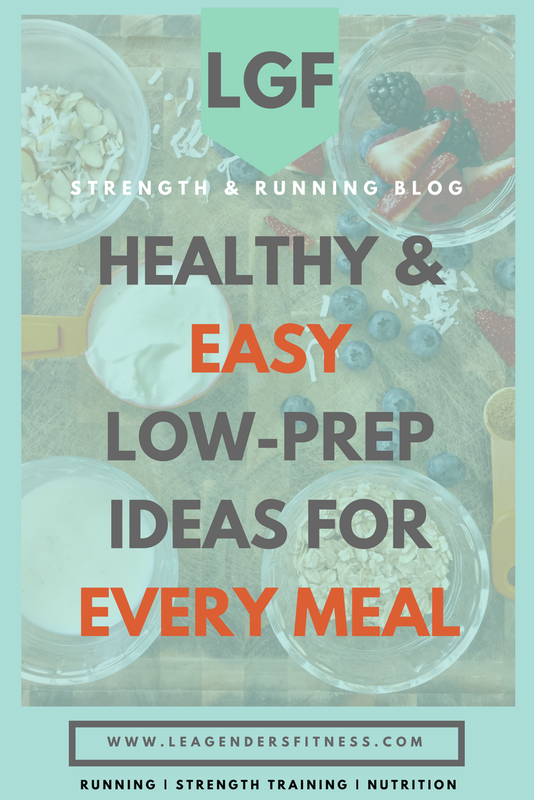 I thought I would share these healthy high-protein recipes for you. These are all personally taste-tested and delicious. 5 healthy high protein smoothie recipes - save to Pinterest for later! Sneak in a serving of spinach, you can't even taste it in this classic green smoothie. Don't let the Girl Scouts have all the fun. Try this healthy high protein twist on the classic Thin Mint. Close your eyes and imagine a tropical vacation complete with little umbrellas in your pineapple flavored drinks. While it is almost never appropriate to eat apple pie for breakfast, you can have this healthy, high protein alternative any meal of the day. Reminisce about the summers of our youth and the beloved ice cream truck while you sip on this delicious orange creamsicle smoothie. Like this post? Do you know one person this could help? You help me grow when you share with your friends and followers. Welcome to the latest edition of workout wednesday when each week I share a new running or runner-specific strength training workout. This week we are talking about core stability and strength. As runners, core strength is important to keep proper form, to provide a stable base between the lower and upper body and to power our stride. You don't need to spend hours in the gym or devote your life to strength training to reap the benefits of runner-specific core work. Spend 5-10 minutes on core exercises before you hit the road for your next run. You'll help activate running muscles and core training can be part of your warm up before you hit the road. This post contains affiliate links. That means if you click on a link and make a purchase, I make a small percentage of the sale with no additional cost to you. No one is getting rich here, it just helps with the cost associated with running (pun intended) this blog. Thanks, as always, for your support. You can work to strengthen your stabilization muscles and joints by providing an unstable, but controllable base like a stability ball. Some of the benefits of balance and stabilization training for runners are improved joint stability, increased flexibility, improved posture control, improved balance and coordination. Core Stability Ball Training. Save to Pinterest for later. Download a printable PDF of this workout. Position the stability ball under the small of your back. Place your hands behind your head, do not pull on your neck, and lift your shoulders and chest up into a crunch. Engage your abs and hold for 3 seconds in top position. Slowly lower back to the starting position. For an added challenge hold a medicine ball for additional resistance. Perform 12 repetitions before moving onto the next exercise. Place the ball against a wall and position the ball in the middle of your back. With your feet about hip width apart and your toes pointing straight ahead, walk your feet forward. Lower yourself into a squat until your thighs are parallel to the floor, like you are sitting in an invisible chair. Be careful not to lean back into the ball, but use it as a guide to lower yourself. Once in the low position, press through the heels and push back up to standing. For an added challenge hold a medicine ball at your chest. Perform 12 reps before moving onto the next exercise. Lie on your back with the stability ball positioned under your calves. Lift your hips off the ground into the starting bridge position, engage your abs and glutes. Bend your knees and lift your hips to curl the ball towards your body. Straighten your legs back out and perform 12 repetitions without lowering your hips to the ground. Position the stability ball under your thighs and walk your hands out until you come into a high plank position with your shoulders directly over your wrists and the ball under your shins. Pull your knees in towards your chest to roll the ball forward, then straighten your legs to return the ball to the starting position. Do not to lower the hips between reps. Perform 12 repetitions, take a one minute break then repeat the circuit one or two more times. Do you work in core and stabilization exercises into your running routine? Give this one a try and let me know what you think on Instagram, Twitter or in the comments! 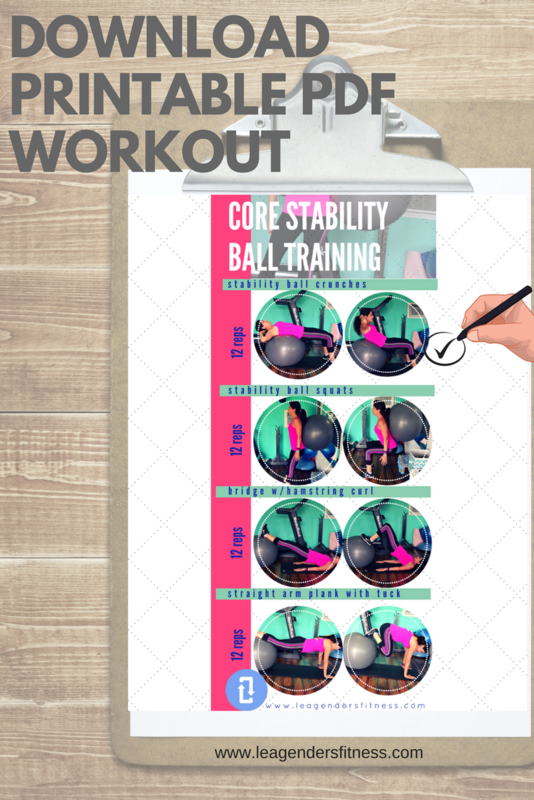 Add your email address to download a printable PDF of this workout with pictures and instructions and to receive news and updates from the strength & running blog. Did you like this post? Do you know one person who might benefit from it? It helps me grow when you share with your friends and followers.